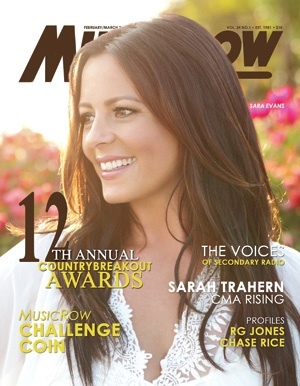 Multi-Platinum selling Country singer and songwriter Sara Evans has been called “one of the most compelling vocalists of her generation.” Evans will release her highly anticipated seventh studio album Slow Me Down on March 11, 2014. The album comes more than two years after the release of Stronger, her second project to top the Billboard Country Album Chart. Despite five No. 1 hits, her new single “Slow Me Down” scored the most first-week adds of her career and was named one of Billboard’s “10 Best Country Singles of 2013.” The song has been steadily climbing the charts with the companion video featuring NASCAR great Carl Edwards in heavy rotation on CMT and GAC. Slow Me Down is co-produced by Evans and Mark Bright (Reba McEntire, Rascal Flatts, Carrie Underwood), who Evans last worked with on her Platinum selling album Real Fine Place (2005). Slow Me Down sees Evans collaborating on three tracks: “Better Off” with Country legend Vince Gill; “Can’t Stop Loving You,” a duet with Isaac Slade of The Fray; and a cover of Gavin DeGraw’s “Not Over You” which features the pop/rock star singing harmonies. This album is what fans have waited for and newcomers are bound to fall in love with. Slow Me Down is Evans at her finest, with her signature powerful vocals that will serve as a reminder of why she has had a level of success reserved for few. Evans co-wrote three of the album’s 11 tracks and some of Nashville’s finest songwriters are represented on Slow Me Down. A who’s who of songwriters on the project include Dave Berg (Keith Urban, Reba McEntire, Blake Shelton), Shane McAnally (Florida Georgia Line, Kacey Musgraves, Kelly Clarkson), Karyn Rochelle (Trisha Yearwood, LeAnn Rimes, Ronnie Milsap), Sarah Buxton (Keith Urban, The Band Perry, Gary Allan), and Shane Stevens (Lady Antebellum, Kellie Pickler, Montgomery Gentry). Since emerging in the late 1990s, Evans has had a prolific recording career resulting in the sale of more than six million albums. She’s had five No. 1 songs, four others appearing in the Top 10, two No. 1 Billboard Country Albums, five appearing on Billboard’s Top 200 all-genre chart, and four consecutive RIAA certified Gold, Platinum or Multi-Platinum albums. She’s received awards from the Country Music Association, Academy of Country Music, a Billboard Music Award and garnered nominations for Grammy Awards, American Country Awards and CMT Music Awards. Always interested in and involved with charitable efforts, Evans has been an active member of the American Red Cross’ National Celebrity Cabinet since 2005 and was presented with the national Crystal Cross for her work with the organization.